As much as Fashion Week is about clothes, celebrities, and an excessive amount of partying, it simply wouldn’t be the same without the music. Each year the fashion world picks out its trendiest performers to attend shows and take the stage at after-parties. Below we’ve selected three acts, some of which have already been embraced by dignified designers, as well as some acts we think should be thrown in the mix next season. Who: One of New York’s hottest DJs, Mazurbate (aka Matthew Mazur) curates an awesomely eclectic mix of hip-hop diva hits and global dance anthems. A part of Jeremy Scott‘s East Coast team, the young talent has become a mainstay at the designer’s iconic New York Fashion Week parties (like the one that went down last night at Space Ibiza), where he sets the floor on fire alongside DJ collective The Misshapes. The Song: His first mix of the year, Mazurbate’s “#BABYWHORE” starts out with the sounds of a Spanish-language soap opera before blending into the Nicki Minaj remix of “No Flex Zone,” a good example of the DJ’s ability to play off humor and hard beats simultaneously. Later in the mix things truly get interesting, with a string of dancehall and dembow bangers, closing out with a crazy Jersey club remix of Rihanna’s “You’re the One” by DJ Irresistible.Current Project: Catch Mazurbate DJing around New York City, and keep up with him on his fabulous Instagram. Who: One of the finalists in VFILES and Def Jam’s DJ championship, Karman ripped his set at the competition held at Webster Hall (which also doubled as VFILES’ Fashion Week afterparty). The L.A.-based producer is an associate of Yung Lean’s Sad Boys crew, which shouldn’t come as a shock upon hearing his beautifully melancholic beats. The Song: A track that otherwise seems fit for a soccer stadium, Karman turns out Ellie Golding’s hit, turning it into a mystical masterpiece, with smartly chopped-up vocals and delicate drums that achieve a sonic fullness most producers would die for. Current Project: Catch Karman performing in L.A. at The Smell on September 19th, and with Suicideyear on October 10th. For more see his Facebook. 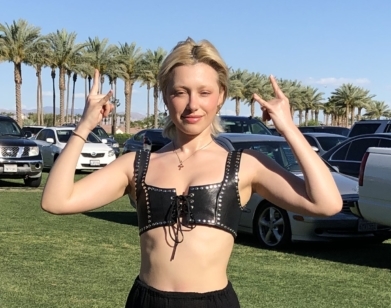 Who: Quickly emerging as one of the most creative sources in cool, new pop, the elusive Sophie is a London-based producer who has become a favorite amongst music heads and fashion folks alike. Songs like “Bipp” and “Hard,” which feature fast-paced industrial sounds, peculiar effects, and a pitched-up female vocalist, have already become dancefloor staples, and the artist shows no signs of slowing down. The Song: “Lemonade” is perfectly chic, switching off between k-pop inspired cadences and a hard-hitting catchy chorus. The strangeness of the track is both undeniable and addictive, its attractive pop tendencies only being elevated by its bizarre quirks. Current Project: Keep up with Sophie via the artist’s website.